Rio Bingo Review | Claim 120 FREE Tickets On Deposit! If you’re a bit of a party animal then head over to Rio Bingo as this is the online bingo site that never sleeps. There’s bingo happening around the clock and we’re not talking about any old bingo here – we’re talking about the cream of the crop. 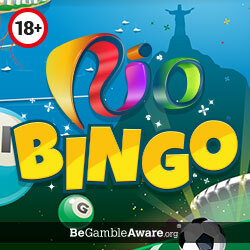 So, get your glad rags on and get ready to party – Rio Bingo style. The Rio Carnival is the biggest party in the world and this is where the site takes its inspiration from so you know it doesn’t do things by halves. Expect great games, big bonuses and phenomenal prizes. The first thing we’ll cover in our review is the welcome offer. Rio Bingo offers new players a fantastic welcome bonus which will help you get the party started. To get a piece of the pie all you have to do is sign up and you will be entitled to 120 FREE Bingo Tickets on your first £10 deposit. As an added bonus this deal features zero wagering requirements, so you get to keep what you win. New players will also unlock 24 hours of free bingo immediately upon registration. No card details are required, so you can check out some games for yourself to see if you like the site before parting with any cash. Deposit £10, get 120 free tickets welcome offer. 30 free bingo cards on your third deposit. Codes are not required for any of the regular promotions or bonuses here, instead, they are automatically applied! It is of course always worth keeping an eye on your email to ensure you don’t miss out on any special one-off promo codes. Everyone and their granny have a tablet or smartphone these days and the great news is that Rio Bingo is mobile friendly which means you can play bingo anytime, anywhere! To play on the go all have to do is enter the site’s URL into your browser then sign in. If you’re new to the site you’ll need to register but if you’re already a member you’ll already have your login details which are the exact same as you use for the main site. If you like to keep things simple then this site will be right up your street because it sticks to 90 ball, 75 ball and 5 line bingo. There might be only three types of bingo on offer but this doesn’t mean that you won’t be spoiled for choice. There’s a great variety of bingo rooms to choose from and what’s really fascinating about them all is that the names of the rooms all stick with the theme which you’ll soon find out when you enter the games lobby. It’s bargain central at Riobingo.com which isn’t surprising as the site is part of the Ignite Bingo network that’s well-known for its cheap bingo tickets and free bingo games. Other sister sites include the likes of Frozen Bingo and Crocodile Bingo, so you can rest assured that you are in good company. The most you’ll ever pay for tickets at this site is 50p but forget about paying for tickets as there’s a ridiculous amount of free bingo for you enjoy. You’ll be lucky to find as many free bingo rooms anywhere else so this is definitely the place to be. We’re not going to mislead you here – most of the free bingo rooms are exclusive to VIP players. However, the biggest freebie is the weekly £5K Bossa Nova Beats which is free for everyone as long as you have deposited £5 within the past six days. If you ever get fed up with bingo and you want to get your kicks somewhere else then you should definitely check out the instant games tab. Here you’ll find a great selection of slots, casino games and scratchcards. If it’s a bargain you’re after you’ll be pleased to know that the slots are just as cheap as bingo with some of them only costing you 1p a spin – you can’t get cheaper than that! Free cards on your second and third deposits. Chance to win £5k every week for free. Minimum withdrawal amount is £5. Needed to be funded player to access most of the free bingo rooms. You can deposit using credit and debit cards, as well as PaySafeCard. The site is powered by top-notch Dragonfish software and licensed by Cassava Enterprises. Having had the privilege to review Rio's sister sites such as Costa Bingo and Sing Bingo, we can assure you that this brand is more of the same. You will get access to a brilliant collection of bonuses, a rewarding no deposit offer and unlimited free bingo games. This site is a great choice if you are on a low budget and don't want to spend much, but also if you are a bit of a high roller and want to play for some large jackpot prizes too.